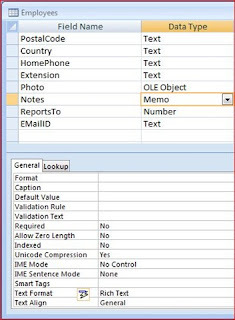 We know that Memo Fields in Microsoft Access Tables gives us much needed flexibility to record variable length Text data. But, in Access Versions earlier than 2007 allows us to enter in plain text format only, like we do in Notepad. 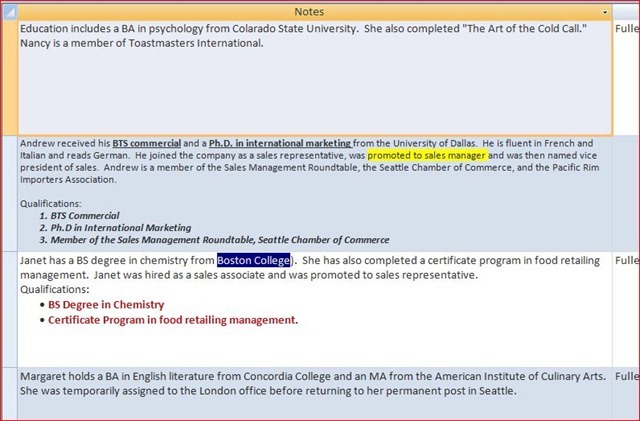 The need for some form of text formatting was always felt necessary to organize them in the form of Numbered List or Bullet List or highlight text to draw attention to important points etc. Well, the waiting is over and here it is in Microsoft Access2007. Let us quickly try and find out how it works. 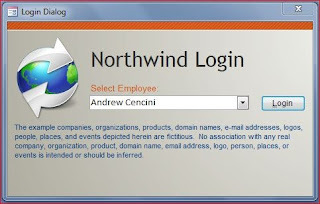 If you have an earlier MS-Access Version Northwind.mdb sample database then open it, otherwise select Sample from the displayed list of Templates and click on the Northwind 2007 Template. 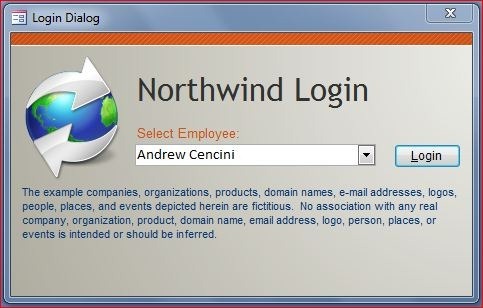 Click on the Folder Icon at the right side to select the folder to save the Northwind 2007.accdb file and click on the Create Command Button to create and open the file. Open the Employees Table in Design View. Click on the Notes Field to select it. Click on the Text Format Property on the General Tab of the Field Properties Sheet. 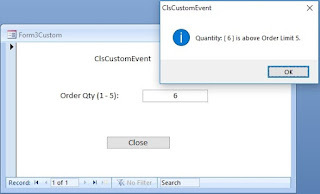 Current value in the Property is Plain Text. 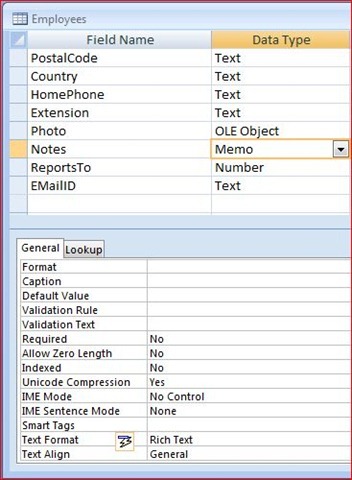 Select Rich Text from the drop down list to replace Plain Text. You will see a warning message as below; click Yes to apply the change. Close the Design View and save the changes. Open the Employees Table in Datasheet View. Expand the Row Height of the records by dragging the intersection of the two records at the left border. Bring the Notes Field values into view by moving the Scrollbar to the right and increase the column width, see the image below. 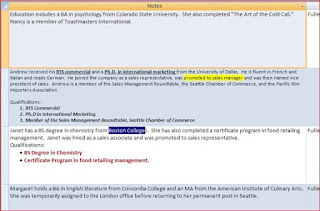 You can now format the Memo Field Text as you apply Text formatting in MS-Word. In the example image above I have created a Numbered List, Bullet Text, applied Bold, Italics, highlighting, alternate rows fill/back color etc. The pictures in the article aren't visible. Thank you for pointing out the Error. Few other pages were also needed corrections.